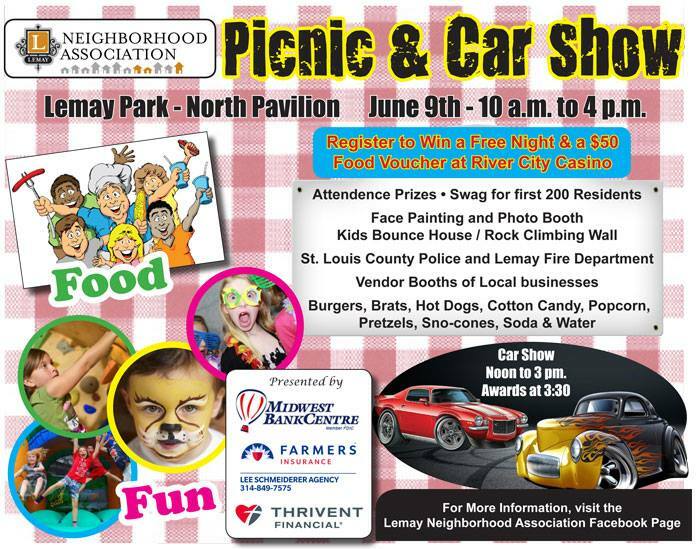 Come join the Lemay Neighborhood Association on June 9th at 10 am – 4 pm, located at Lemay Park for their 3rd annual community picnic. This year we have inflatables for the kiddos, a climbing wall and a car show for the bigger kids. (Car show info below) Hamburgers, Brats and dogs, along with sno-cones, popcorn, cotton candy and Gus’s pretzels and drinks will be available for sale by the Scouts BSA and Girl Scouts. Lemay Fire will be on hand, showing off the trucks along with St. Louis County Police having vehicles on display, so you can get an up close look. The Art bus will be there along with other games for the kids, along with a face painting clown and a photo booth. The only thing we ask in return is that you bring at least two can goods or nonperishable food items to be given to local food banks.